The Ghaste family bought a ready flat in Dadar in a building constructed by Dialani Developers through Yogi Kripa Estate Consultants. As per the agreement between the builder, and Shailendra Ghaste and his mother Suman as the joint purchaser, the flat, with a carpet area of 760 sq ft, was sold for Rs 25 lakh. On taking possession on September 26, 1999, they found the flat was smaller. Shailendra took up the issue with the builder. As his grievance was not redressed, Shailendra, through his constituted attorney and father, Sakharam, filed a complaint before the Maharashtra State Commission against Jagdish Dialani, the sole proprietor of Dialani Developers, as well as against the estate agent. The complaint was contested. The builder claimed the shortfall in area was an inadvertent lapse—the term carpet area was used when the 760 sq ft actually referred to built-up area. The state commission observed that the requirement to mention carpet area in the agreement was introduced in 2008 by an amendment to the Maharashtra Ownership of Flats Act. Since the agreement was executed earlier, the builder could not be faulted for mentioning the built-up area instead of the carpet area. The commission posed the question: What should be accepted when there is a conflict between the typed clause of the agreement and the approved floor plan annexed to it? Going by the plan approved by the municipal corporation, the flat had a built-up of 760 sq ft. Since this plan had been annexed to the agreement, the commission concluded the builder had not suppressed any fact, and dismissed the complaint. Shailendra then approached the National Commission, which ordered the builder to get the carpet area re-measured. In his report, the architect included the area under the door jams and the walls. The National commission observed that the area under the internal and external walls cannot be included in the carpet area. Similarly, the area under the door jams is already accounted for in the floor area and cannot be separately added to the floor space. It concluded that instead of 760 sq ft, the actual carpet area was only 713.39 sq ft, so the area was lesser by 46.61 sq ft. The commission held that the builder was liable for this deficiency and not the estate agent. Accordingly, in an order delivered by Justice VK Jain on July 24, 2018, the National commission ordered Dailani Developers to refund the value of the deficient carpet area amounting to Rs 1,53,388. In addition, the builder was also directed to refund Rs 7,669 toward stamp duty on the deficit area of 46.61 sq ft. Both these amounts would also carry 9% interest from the date of the complaint till refund. Conclusion: A builder can be held liable for manipulation in carpet area. NCDRC rules areas under walls internal or external cannot be included in Carpet area, orders refund of the value of deficient area and stamp duty. The government hasn’t carried out a feasibility study as part of its preparations for creating the world’s tallest statue. An iconic monument to celebrate the life and times of Chhatrapati Shivaji Maharaj has been an aspiration of Maharashtra’s political leaders since the 1990s. Traditionally, Shivaji statues have mostly consisted of a bust, many of them sculpted by a well-known artist from Kolhapur. Then there were statues showing the Maratha king on a throne and some mounted on a horse. However, the concept of an equestrian statue with a drawn sword held aloft is very recent. The design and drawing of the statue of Chhatrapati Shivaji Maharaj which has now been accepted for construction was prepared in 2013 by the principal of the J.J. School of Architecture and his team. The drawing of the statue of Shivaji on a horse holding a sword. 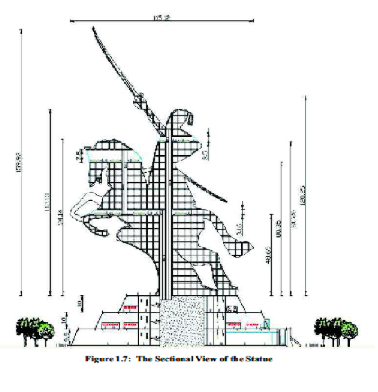 The design envisages the height of the horse as 94 m and the height of the horse and Shivaji Maharaj as 112 m. The total height of the monument – 190 m – is made up of the pedestal of 30 m, height of the raised arm as 120 m and the sword of 40 m. The idea is to construct the ‘tallest statue in the world’. But this configuration has introduced serious technical challenges in designing the tall, massive cantilevered elements with an adequate factor of safety. The Maharashtra Government Resolution of February 28, 2014 sealed the location as a rock outcrop in the sea, 2.4 km west of Nariman Point and 1.2 km from Raj Bhavan.This was chosen to maximise visibility from Mumbai’s iconic Marine Drive. The outcrop is submerged under the sea, except when the tide level is 1 m below mean sea level (MSL). By raising the height of the outcrop to 8 m above MSL, the project was planned in 2014 to be built on 15.9 ha of reclaimed land. The government floated this concept and wrote to various authorities in Mumbai, who furnished NOCs (no objection certificates) promptly, not wanting to comment adversely on a high-profile politically backed project. The caveats which were part of the NOCs were promptly relegated to the background by the government. The state government selected the National Institute of Oceanography, Goa, and the National Environmental Engineering Research Institute (NEERI), Nagpur to conduct the environmental impact assessment. They dutifully produced a report of 529 pages in November 2014, covering all conceivable aspects affecting air and water pollution. For example, 58 pages of the report are devoted to water quality, concluding, as expected, that it is contaminated by sewage. The EIA takes no cognisance of the garbage which has devastated Versova beach for years. Just last week, garbage was spewed by high tides on Marine Drive, the viewing platform for the venerable Shivaji memorial. The EIA dismissed the idea that members of the fishing community, who live on Mumbai’s coasts, could be displaced. They opined that no dredging was envisaged, turbidity was acceptable and no significant impact on the environment was reported. The EIA report, however, is pointedly silent on crucial items like quarry sources for reclamation, effect of breakwaters on siltation, and the vital factor of total inaccessibility of the site during four months of the monsoon season from June to September. The report also dealt with subjects outside the competence of the two institutions authoring the report, for example passenger water transport to the site. The boat route they included in the report showed a track over submerged and visible wrecks of boats, which had foundered on the infamous Prongs reef, which has a dedicated light house to warn mariners, and is shown clearly on Hydrographic charts. They assumed that no less than 10,000 tourists per day could visit the memorial from the Gateway of India, and from a jetty at the National Centre for the Performing Arts at Nariman Point (which has no depth of water). They ignored completely the issue of structural safety of the monument poised over a public plaza. Curiously, the report also failed to mention that a wind tunnel test on a scale model is mandatory to analyse the response of the structure to wind loads in a cyclone prone area. They assessed the wind speeds during cyclones as only 25 m per second, whereas all such structures are to be designed to withstand 55 m/s occurring in gusts. The report assumed parking will be provided at Kala Ghoda, an unthinking statement considering it is a well established heritage precinct. In a foray well outside their competence, they included a compilation of the estimated cost as Rs 1,400 crore. In any project, the first requirement is to carry out a ‘feasibility study’. This seems to have eluded the government, which merely appointed a ‘Project Implementation and Monitoring Committee’ chaired by an MLC, and a ‘High Powered Steering Committee’ chaired by the chief secretary. There were other committees to like an ‘Apex Committee’ and a ‘Technical Committee’. The danger of entrusting tasks to a committee is that each ex-officio member, busy with his or her own primary duties, expects the other members to apply their minds to the issues at hand, and take responsibility for decisions arrived at. The chairpersons only have second-hand information and expect the specialists members to have studied the subject. The executing agency, in this case the chief engineer special projects of the public works department, is a transferable post which has had four incumbents in as many years, with gaps between appointees. The world’s tallest statue does not get built by a committee of ex-officio government servants. The construction of the project office at Cuffe Parade, Colaba in south Mumbai has itself been found to be in violation of Coastal Regulation Zone criteria and has been ordered to be shifted to the World Trade Centre, though so far even this move has not been effected. In contrast, the Statue of Unity under construction at Ahmedabad has a straightforward concept of a stable upright standing figure of Sardar Vallabhbhai Patel. It has been designed and analysed for wind loads of 44 m/s and other phenomena like vortex shedding. Even the effect of the slight forward displacement of the right foot has been analysed and catered for. There is adequate space for construction and the site is accessible at all times. In the case of the Shivaji memorial, one late attempt at analysing the safety of aspects was initiated in a letter to the civil engineering department of the Indian Institute of Technology, Bombay in December 2015, to study the structural stability of the memorial. It is still a mystery why the IIT-B accepted this task in the absence of (in their own words and emphasis) “…ANY structural design”. They nevertheless submitted a quotation for Rs 2.29 lakh for a report to be completed in one week. The final report was submitted in August 2016 concluding that “…such a structure can be constructed”. The “…base of the sword cantilever overhang” was mentioned as critical. In the “final” short report of only seven paragraphs, four diagrams and one table, one column of data got copied to another column by mistake. Regrettably, the customer, the PWD, did not notice the error for two years. So one can draw one’s own conclusion on the importance given to structural saftety. The error was pointed out by APLI Mumbai in May 2018, immediately after obtaining a copy through the Right to Information Act 2005, our saviour. The error has since been corrected, but the conclusions were not altered. On reading the IIT-B report, APLI Mumbai pointed out to the author and the client PWD that the assumptions made in the report are not tenable. The sword is assumed to be a hollow cylinder of length 50 m, outer diameter 4 m, and inner diameter 2 m. Even with a lattice design, such an appendage will weigh 1,200 tonnes, to be cantilevered from one end and reaching a height of 190 m, (equivalent to a 55-storied building), in the middle of the sea. The arm holding the sword was assumed by IIT-B to be of length 33.8 m, outer diameter 8 m and inner diameter 5 m. Such a steel cylinder will weigh a phenomenal 8,000 tonnes. How can a theoretical study conclude that such gigantic cantilevers can be erected and supported on a small reclaimed island? These queries have been sent to IIT-B, who have agreed to explain their report. Clarification from the client, PWD, has not yet been forthcoming. In October 2015, tenders were called for appointing project management consultants for the project. Of four bidders, Tata Consulting Engineers even suggested that the statue should be of Shivaji Maharaj seated on a throne. However, the monitoring committee selected EGIS India (with their principals in France), who were appointed with a consultancy fee of Rs 94.7 crore of which 40% (Rs 37 crore) is the pre-tender portion. EGIS produced a concept design report and the tender documents for construction placing all responsibility for design, engineering, procurement, construction and even maintenance on the hapless contractor. Nowhere in all the voluminous, over 1,000 page concept reports or tender documentation is it mentioned that the site is not accessible for four monsoon months. It was not even mentioned that the 200 passenger boats plying through the Mumbai harbour are not authorised to cross Colaba point which marks the southern tip of Mumbai island, towards the western Marine Drive. In addition, the boats registered under the Inland Vessels Act are prohibited from venturing beyond the Base Line promulgated by a government of India gazette. To cross the Base Line requires certification under the Merchant Shipping Act and upgradation of the hull and machinery to meet the stringent specifications of the Indian Register of Shipping. This makes the memorial island site inaccessible to the general public, as the cost of a 100 passenger boat increases from Rs 3 crore to Rs 10 crore to meet the regulatory criteria. The EGIS concept design brought out that two breakwaters were required of a total of 608 m to enclose a basin for passenger jetties. Design of breakwaters is virtually the exclusive specialisation of the Central Water and Power Research Station, Khadakvasla but they have not been consulted, to save costs. The breakwaters require one million tonnes of rock, but there was no mention by the consultant of potential sources. For construction, the reclamation material requirement was 4,000 tonnes per day for a year, but there was no mention of logistics. Laterite was chosen for the sea walls to simulate Shivaji’s forts. Laterite is available only in a very few areas like the south of Chiplun, south of Mumbai and probably in forested hills, but no cautionary statement of environmental degradation was included. For all this, approval by a proof consultant is the norm, but is glaringly absent for this project. The tender for construction was posted in October 2016 and three bids were received in February 2017. The lowest bid was for Rs 3,826 crore, the next bid was for Rs 4,779 crore and the third bid was rejected for not meeting technical qualification criteria. The lowest bid was 50% higher than estimated. Thereafter, the high-level committee simply asked the lowest bidder to reduce the cost, with freedom to reduce the specifications too. This exercise was given the dubious name of a ‘Cost Optimisation Report’ and thus, re-tendering was evaded. As an afterthought, in February 2018, the government tailored a fig leaf in the form of an opinion from a former attorney general and a former chief justice of India who opined that “Yes, the government may explore the possibility of cost reduction with L1 bidder”. The government conveniently did not obtain a learned opinion on whether the specifications could be decided by the bidder, which is somewhat unusual. The cost reduction has been achieved by a series of measures reducing safety and utility. The bidder has been allowed to eliminate the cellular coffer dam costed at Rs 45 crore designed to secure the reclamation area. The interlocking concrete blocks to be placed to form the base of the sea wall costed at Rs 282 crore have been replaced by a random rubble rock bund costing Rs 170 crore. The size of the island to be reclaimed has been reduced from 10.5 ha to 6.8 ha. The height of the reclaimed island has been reduced by 1 m to 7 m (above MSL). This increases risk of flooding in a storm, which was the original criterion for the proposed height. The cross section of the sea wall has been reduced by half, from 42 sq m to 21 sq m per RM. The north breakwater has been merged with the approach trestle, making a mockery of the concept design to achieve tranquillity for passenger jetties catering to unsuspecting tourists. The south jetty has been scrapped, reducing the ability to meet any adverse contingency at the main jetty, violating an important safety condition of the environment clearance by the environment ministry. The facilities required to cater to 10,000 visitors per day, including senior citizens, women and children, have to be ultra safe. The cavalier treatment of passenger safety is unacceptable, in what is proclaimed as a world class monument. The cost estimate of the bronze statue has been reduced from Rs 819 crore to Rs 576 crore, by changing the specification of the base panels from bronze to concrete. The cost optimisation report which has been approved by the government includes spraying of concrete with molten metal to make it look like bronze. All this in the middle of the sea. To reduce the cost, and yet increase the height of the monument to 212 m, the coterie of officials who have taken control of the changes reduced the height of the statue by 7 m and increased the disproportionate length of the sword from 38 m to 45.5m. Considering that the length of the sword is already recognised as a critical factor for safety of the monument structure, this maladjustment is patently irresponsible. This has been justified in the Cost Optimisation Report by saying “… given that a particular stance of the statue was already part of the tender (therefore not subject to extensive modification) the most appropriate method was to consider an increase in the sword height…”. All these contortions have been introduced to increase the height of the monument from 190 m to 210 m to 212 m, so that the monument would achieve the ephemeral distinction of the tallest statue in the world, until China increases the height of their existing monument by a few more metres. Three floor plates of the pedestal which are part of the structure providing stability and strength have been omitted. Finally, the obligation of one year operation and maintenance of the monument which was part of the original tender has been dropped dead, an absolutely unprecedented deviation in a major government contract. With all these questionable measures the bid price was reduced from Rs 3,826 crore to Rs 2,500 crore. The Cost Optimisation Report was submitted on February 28, 2018, and was approved by the government, a Letter of Acceptance (LOA) issued and accepted by the bidder, all on the very next day, March 1, 2018. Appeals by APLI Mumbai to the government that the LOA should not be converted into a contract have remained unanswered. On the contrary, the government has awarded the contract for design, engineering, procurement and construction (but no maintenance) on June 28, 2018, condemning the taxpayer to bear the cost of a flawed project. It could be that the government is keen to see activists file a PIL resulting in intervention by the courts. Only this can save them from further descent into an abyss of pitfalls. It is a sad commentary that pre-eminent research institutions mechanically produce voluminous reports which obfuscate logical conclusions and assist the government in skirting core issues. A leading academic institution like IIT-B has failed to call a spade a spade. The country’s leading engineering company has accepted a contract for an unsafe project yet stating for the record as late as February 2018 that “Of particular importance are wind tunnel testing, metallurgical and weathering studies and physical modelling studies”. All this two weeks prior to signing the LOA that “the work will be completed in 36 months from the date of issue of the LOA”, so from March 1, 2018 to February 28, 2021, an impossibility for even the Trojans, and leaving open avenues for huge claims for cost escalation due to failure of the client to meet contractual obligations. The law abiding citizens’ duty apparently is to quietly pay for this folly, just like they do for other grandiose projects. The amounts right now are 5% of the Rs 2,500 crore (so Rs 125 crore) due to the contractor on signing of the final contract, which was scheduled on June 28, 2018, and Rs 34 crore to the consultants. Faced with these compelling circumstances the government must, at least now, carry out a proper feasibility study before going ahead. Until feasibility is established, no further public expenditure is warranted on this project. This is the least the government can do to avert the inevitable hazards of large projects. Any structure will remain the tallest in the world only for a limited period, until some other monument overtakes it. Therefore it should not be a primary objective for any monument. Utility, safety, honour and safeguarding public monies have their place in public governance, and need to be respected. Vice Admiral I.C. 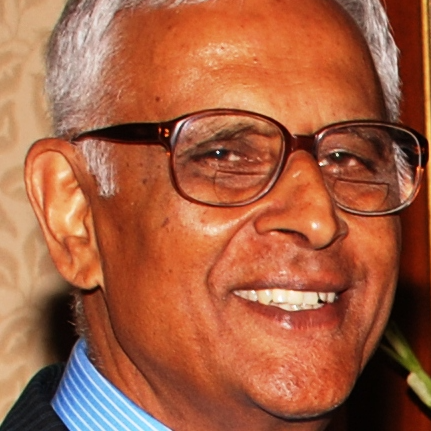 Rao (retired) is a marine engineer and ​president​ of APLI Mumbai​, a citizens forum. The government is considering a proposal to amend the Right to Information (RTI) Act, 2005 to frame rules on salaries and services of Chief Information Commissioner (CIC) and Information Commissioners (ICs) . According to the proposed amendment, the salaries, allowances and other terms and conditions of service of the CIC and ICs “shall be such as may be prescribed by the central government”. The tenure of information commissioners at the centre and the states is proposed to be amended from “a term of five years” to “terms as may be prescribed by the central government”. RTI activists have strongly opposed amendments to the Act saying they are aimed at lowering the stature of Information Commissions from equivalent to the Election Commission (EC) and to do away with their five years fixed tenure. 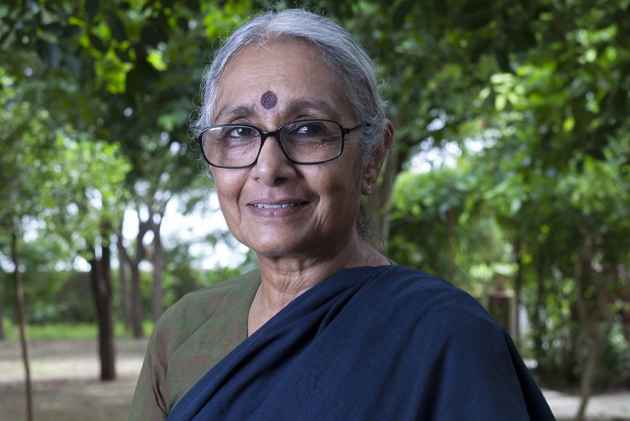 In an interview to Outlook, social activist Aruna Roy said the proposed changes will reduce the commission to the level of any other department in the government. Roy said RTI law has become a huge worry for all those who are corrupt and misuse power in the government. And therefore, there has been a desire to neutralise it. “Any government that is corrupt and arbitrary will not promote the RTI law,” she said. The government is planning to bring amendments to the RTI Bill. What do these proposed changes mean? The most dangerous thing about these amendments is that it’s undermining the independence of the Information Commission and reducing it to the level of a department of the government of India…If the independence of all institutions are going to be whittled down by the government, then democratic institutions created to maintain a check and balance, and to ensure that the constitutional rights are delivered will be nullified. Do you think the proposed changes will destroy the RTI act completely? I think they will. The commission as a body has many functions. One is to implement the RTI act, but also to safeguard the peoples right to information. If these changes come into effect, will they interfere with RTI activists freedom to make independent decisions? Yes, absolutely… The Act has given us, for the first time in independent India, the people of this country have gained the right to be part of a process of democratic government- because we know then what is happening inside the government. We have the right to understand how our sovereignty is being used or misused. We have the right to know which individual is taking what decision – it’s a complete window into the functioning of government in our name. So. the fear of every government, is that they will be monitored by notions of justice and equality, that we hav egiven to ourselves in the Constitution. We know that RTI is one of the most important tools for the citizens of this country. Why do you think the government is proposing changes to the Act? For the first time in the history of independent India, there is an Act which gives us the right to monitor the government about corruption and arbitrary use of power at every single point of its transactions. There are between 60 and 70 lakh users of the law every year. They are being monitored and checked in many different parts of India, in many different departments, and at many different points of interaction between citizens and the state. In each one of these interactions, the government is held accountable and liable in one way or the other…Just look at the millions of sets of eyes looking into the system, to monitor whether it’s doing right or wrong. The law has become a huge worry for all those who are corrupt and who misuse power in government…Any decent democracy will promote it (the RTI law); any givernment that is corrupt and arbitrary will not promote the RTI law. If the proposed changes to the Bill are made, what will be the next step of Commission and activists? We already had one agitation yesterday (Wednesday). We will now agitate all over the country, and processes of public protest have already begun. And of course, we finally have recourse to the vote. Any government that goes against the RTI will never receive the mandate of its people. Any government which threatens the RTI will become a terribly unpopular one, as it will be seen to be blatantly standing up for corruption and for the arbitrary use of power. The Reserve Bank of India (RBI) is shortly issuing new notes of Rs100 denomination in the Mahatma Gandhi (New) Series with lavender as base colour. The dimensions of the note at 66mm × 142mm are smaller than the one in circulation at present with a size of 73mm X 157mm. This, dimension change, however, would be a new headache for everyone from users to banks and automatic teller machine (ATM) service providers. Rajiv Anand, Executive Director of Axis Bank told the Economic Times, “It looks like we may have to recalibrate the ATMs because the new Rs100 is neither the size of the old Rs100 note nor the Rs200 note for which we have recalibrated our ATMs.” The cost of the exercise could be Rs100 crore. According to Radha Rama Dorai, Managing Director – ATM & Allied Services at FIS, this new Rs100 currency note would require re-calibration of the ATMs and more investment in terms of cost and efforts. “The dimensions of the new Rs100 currency note are different from that of the existing Rs100 currency note. To dispense the new notes from the ATM would require recalibration of the currency cassette in the ATMs. The ATM industry is just about finishing the calibrating the ATMS for Rs200 denomination. This recalibration would again require investment in terms of cost and efforts,” she says. Earlier in January 2018, RBI had asked banks to re-calibrate their ATMs for the new Rs200 currency notes. However, many banks are yet to complete the job. FIS manages a network of 12,000 plus ATMs, spread across the country particularly in the difficult terrains. In a release, the Reserve Bank had said that all banknotes of Rs100 issued in earlier series would continue to be in operations as valid tender and printing and supply of the new Rs100 notes would increase gradually. Since the old and new notes are likely to co-exist till such time RBI completely withdraws the old notes, it will be difficult to re-calibrate all the ATMs to soon support the new dimensions of the note. There is likelihood of an imbalance between the supply of the new notes and the withdrawal of the old notes, especially in the hinterland. If the supply of the new currency is unable to fill the gap created by the withdrawal of the old currency, dispensation of Rs100 currency notes through the ATMs will get affected till such time as the imbalance exists. “It would be prudent to let banks and service providers decide when to calibrate the ATMs for the new currency note, depending on the ‘supply-withdrawal’ situation in each State over the next few quarters,” Ms Dorai says. The new Rs100 note will have the motif of ‘Rani ki vav’ – a stepwell located on the banks of Saraswati river in Gujarat’s Patan and a UNESCO heritage site. The new series of Rs100 currency notes will be the fifth new banknote design to be issued by the Reserve Bank, after the government demonetised Rs500 and Rs1,000 banknotes in November 2016. Elderly parents, if ill treated, can take back property gifted to their son, says the Bombay High Court. Upholding an order passed by the Maintenance Tribunal, the Bench of Justice Ranjit More and Justice Anuja Prabhudesai said under the Maintenance and Welfare of Parents and Senior Citizens Act, the gift deed can be cancelled. According to a report from the Economic Times the Act, passed in 2007, has provisions that protect parents and elderly persons who have signed away their property or assets to a person so that they would be taken care of, but are then left destitute. Sharing details of the case, the report says, the senior citizen, after death of his wife, wanted to remarry. At that time, his son and daughter-in-law requested him to transfer 50% share in his flat at Andheri, which he did in May 2014. However, after the marriage, the son and daughter-in-law started insulting second wife of the senior citizen, and both were forced to leave their Andheri flat. The father then filed application in the Maintenance Tribunal, which ruled in his favour. However, the son challenged this order in the High Court. A meeting was convened to discuss the mis-interpretation of the RTI act due to precedence setting judgments made by the Supreme Court. Several prominent RTI activists were present for this meeting.